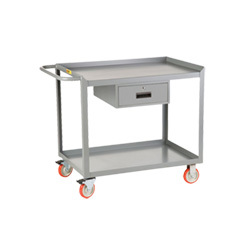 Mobile workstations are ideal for situations in which the worker needs to move to the materials being worked on. Three of the four sides of the top work area have a retaining lip to keep materials on the workstation, and the fourth is flush to allow for easy accessibility. A lockable drawer is located beneath the top shelf for storage of items that need added security. A lower shelf, with 18" of clearance between the shelf and drawer, adds additional storage space so the top shelf can be left open to work on products. The 5" non-marking polyurethane casters make relocation simple, and the two rigid and two swivel caster design allows for better handling. When it is time to park the workstation, two total lock swivels can be deployed, these locks not only keep the wheel from turning but also lock the entire caster from swiveling for a more stable brake.